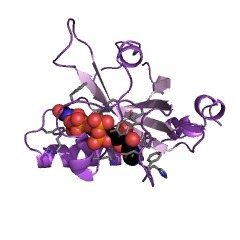 Riboflavin is converted into catalytically active cofactors (FAD and FMN) by the actions of riboflavin kinase, which converts it into FMN, and FAD synthetase, which adenylates FMN to FAD. 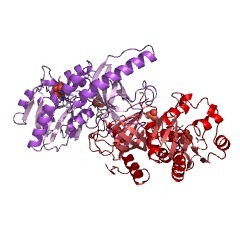 Eukaryotes usually have two separate enzymes, while most prokaryotes have a single bifunctional protein that can carry out both catalyses, although exceptions occur in both cases. 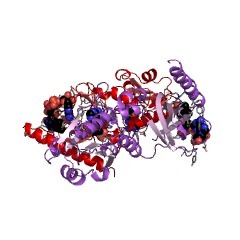 While eukaryotic monofunctional riboflavin kinase is orthologous to the bifunctional prokaryotic enzyme (PUBMED:14580199), the monofunctional FAD synthetase differs from its prokaryotic counterpart, and is instead related to the PAPS-reductase family (PUBMED:17049878). 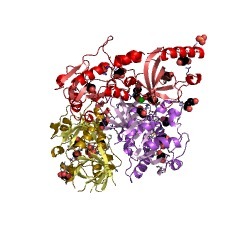 The bacterial FAD synthetase that is part of the bifunctional enzyme has remote similarity to nucleotidyl transferases and, hence, it may be involved in the adenylylation reaction of FAD synthetases (PUBMED:12517446). 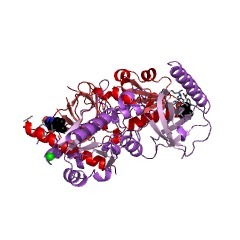 This entry represents riboflavin kinase, which occurs as part of a bifunctional enzyme or a stand-alone enzyme. 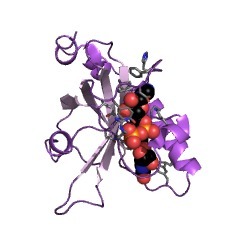 Riboflavin is converted into catalytically active cofactors (FAD and FMN) by the actions of riboflavin kinase (EC 2.7.1.26), which converts it into FMN, and FAD synthetase (EC 2.7.7.2), which adenylates FMN to FAD. 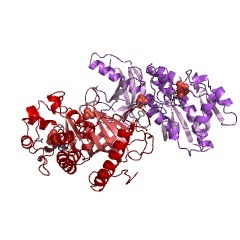 Eukaryotes usually have two separate enzymes, while most prokaryotes have a single bifunctional protein that can carry out both catalyses, although exceptions occur in both cases. 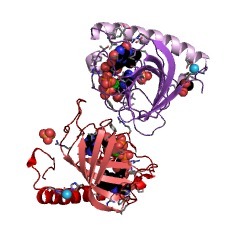 While eukaryotic monofunctional riboflavin kinase is orthologous to the bifunctional prokaryotic enzyme [(PUBMED:14580199)], the monofunctional FAD synthetase differs from its prokaryotic counterpart, and is instead related to the PAPS-reductase family [(PUBMED:17049878)]. 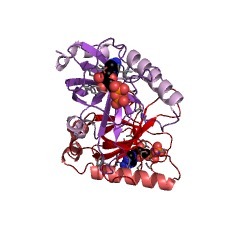 The bacterial FAD synthetase that is part of the bifunctional enzyme has remote similarity to nucleotidyl transferases and, hence, it may be involved in the adenylylation reaction of FAD synthetases [(PUBMED:12517446)]. 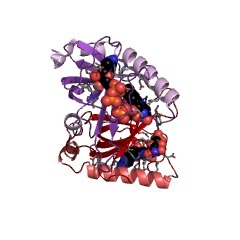 This entry represents the riboflavin kinase domains from bacteria and eukaryotes. 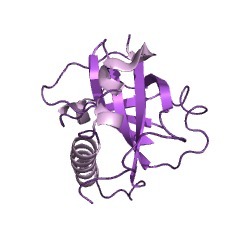 There are 21800 Flavokinase domains in 21799 proteins in SMART's nrdb database. Taxonomic distribution of proteins containing Flavokinase domain. This tree includes only several representative species. The complete taxonomic breakdown of all proteins with Flavokinase domain is also avaliable. Click on the protein counts, or double click on taxonomic names to display all proteins containing Flavokinase domain in the selected taxonomic class. Over-expression in Escherichia coli, purification and characterization ofisoform 2 of human FAD synthetase. 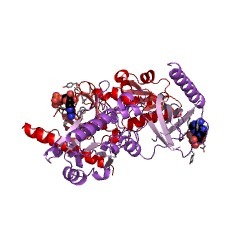 FAD synthetase (FADS) (EC 2.7.7.2) is a key enzyme in the metabolicpathway that converts riboflavin into the redox cofactor FAD. 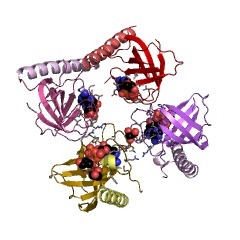 The humanisoform 2 of FADS (hFADS2), which is the product of FLAD1 gene, wasover-expressed in Escherichia coli as a T7-tagged protein and identifiedby MALDI-TOF MS analysis. Its molecular mass, calculated by SDS-PAGE, wasapprox. 55 kDa. 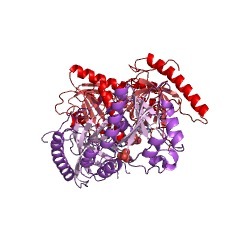 The expressed protein accounted for more than 40% of thetotal protein extracted from the cell culture; 10% of it was recovered ina soluble and nearly pure form by Triton X-100 treatment of the insolublecell fraction. hFADS2 possesses FADS activity and has a strict requirementfor MgCl2, as demonstrated in a spectrophotometric assay. 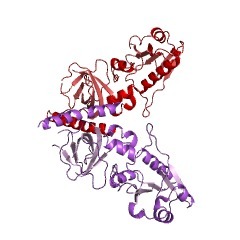 The purifiedrecombinant isoform 2 showed a kcat of 3.6 x 10(-3)s(-1) and exhibited aKM value for FMN of about 0.4 microM. 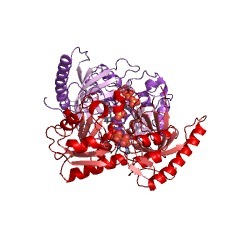 The expression of the hFADS2 isoformopens new perspectives in the structural studies of this enzyme and in thedesign of antibiotics based on the functional differences between thebacterial and the human enzymes. 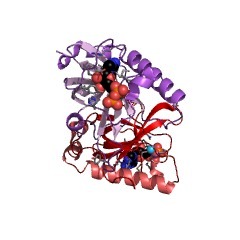 Crystal structure of flavin binding to FAD synthetase of Thermotogamaritima. Ligand binding-induced conformational changes in riboflavin kinase:structural basis for the ordered mechanism. 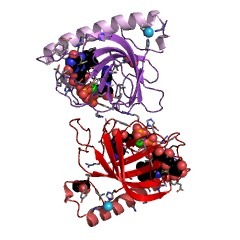 Riboflavin kinase (RFK) is an essential enzyme catalyzing thephosphorylation of riboflavin (vitamin B(2)) in the presence of ATP andMg(2+) to form the active cofactor FMN, which can be further converted toFAD. 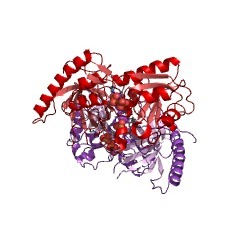 Previously, the crystal structures of RFKs from human andSchizosaccharomyces pombe have been determined in the apo form and incomplex with MgADP. 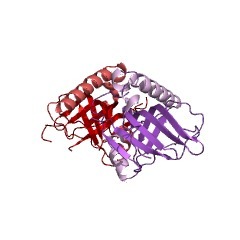 These structures revealed that RFK adopts a novelkinase fold and utilizes a unique nucleotide binding site. The structuresof the flavin-bound RFK obtained by soaking pre-existing crystals werealso reported. Because of crystal packing restraints, these flavin-boundRFK complexes adopt conformations nearly identical with that ofcorresponding flavin-free structures. 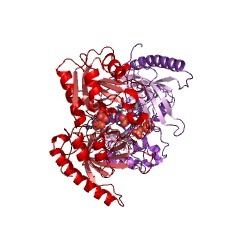 Here we report the structure ofhuman RFK cocrystallized with both MgADP and FMN. Drastic conformationalchanges associated with flavin binding are observed primarily at theso-called Flap I and Flap II loop regions. 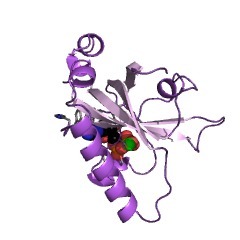 As a result, the bound FMNmolecule now interacts with the enzyme extensively and is well-ordered.Residues from Flap II interact with Flap I and shield the FMN moleculefrom the solvent. The conformational changes in Flap I resulted in a newMg(2+) coordination pattern in which a FMN phosphate oxygen and Asn36 sidechain carbonyl are directly coordinating to the Mg(2+) ion. The proposedcatalytic base Glu86 is well-positioned for activation of the O5' hydroxylgroup of riboflavin for the phosphoryl transfer reaction. The structuraldata obtained so far on human and yeast RFK complexes provide a rationalefor the ordered kinetic mechanism of RFK. A conserved domain in prokaryotic bifunctional FAD synthetases canpotentially catalyze nucleotide transfer. Biosynthesis of flavin adenine dinucleotides in most prokaryotes iscatalyzed by a family of bifunctional flavin adenine dinucleotide (FAD)synthetases. These enzymes carry out the dual functions of phosphorylationof flavin mononucleotide (FMN) and its subsequent adenylylation togenerate FAD. Using various sequence analysis methods, a new domain hasbeen identified in the N-terminal region that is well conserved in all thebacterial FAD synthetases. We also identify remote similarity of thisdomain to the nucleotidyl transferases and, hence, this domain issuggested to be invloved in the adenylylation reaction of FAD synthetases. 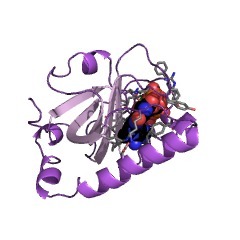 Regulation of riboflavin biosynthesis in Bacillus subtilis is affected bythe activity of the flavokinase/flavin adenine dinucleotide synthetaseencoded by ribC. This work shows that the ribC wild-type gene product has both flavokinaseand flavin adenine dinucleotide synthetase (FAD-synthetase) activities.RibC plays an essential role in the flavin metabolism of Bacillussubtilis, as growth of a ribC deletion mutant strain was dependent onexogenous supply of FMN and the presence of a heterologous FAD-synthetasegene in its chromosome. Upon cultivation with growth-limiting amounts ofFMN, this ribC deletion mutant strain overproduced riboflavin, while withelevated amounts of FMN in the culture medium, no riboflavinoverproduction was observed. 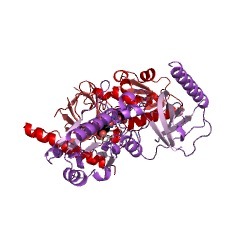 In a B. subtilis ribC820 mutant strain, thecorresponding ribC820 gene product has reduced flavokinase/FAD-synthetaseactivity. In this strain, riboflavin overproduction was also repressed byexogenous FMN but not by riboflavin. Thus, flavin nucleotides, but notriboflavin, have an effector function for regulation of riboflavinbiosynthesis in B. subtilis, and RibC seemingly is not directly involvedin the riboflavin regulatory system. The mutation ribC820 leads toderegulation of riboflavin biosynthesis in B. subtilis, most likely bypreventing the accumulation of the effector molecule FMN or FAD.